"Fibrations! : New England Fiber Art and Mixed-Media Invitational Exhibition" brings works from 15 artists to the Great Hall in Springfield. For this show — the fifth since its inception in 2012 — the venue extends its reach to artists from around New England. The diverse show puts talented Vermont artists head-to-head (and bobbin-to-thimble) with some stiff competition, and they meet it handily. Great Hall coordinator Nina Jamison, Susan Damone Balch and Lynn Barrett selected the artists to invite. For centuries, fiber arts were the province of homemakers who used them to create utilitarian objects, often with exceptional craftsmanship. The painstaking, labor-intensive endeavors were considered "women's work" and thus dismissed as an art form. Post-World War II, curators coined the phrase "fiber arts," and the 1960s and '70s ushered in a revolution for the medium. Artists expanded from weaving to coiling, knotting, lashing, plaiting and myriad other techniques. They explored the qualities of new materials and tested them on nonrepresentational forms, as well as figurative, representational and fantasy forms in two and three dimensions. The women's movement embraced fiber arts, honoring their connection with textiles from the Middle Ages through the Industrial Revolution. Contemporary artists have further reinvigorated the medium. That women still rank among the most prominent fiber artists is reflected in "Fibrations!" — all those represented here are female. Viewers of this exhibit will find some of the most exceptional pieces clustered together. Two dominate an end wall. 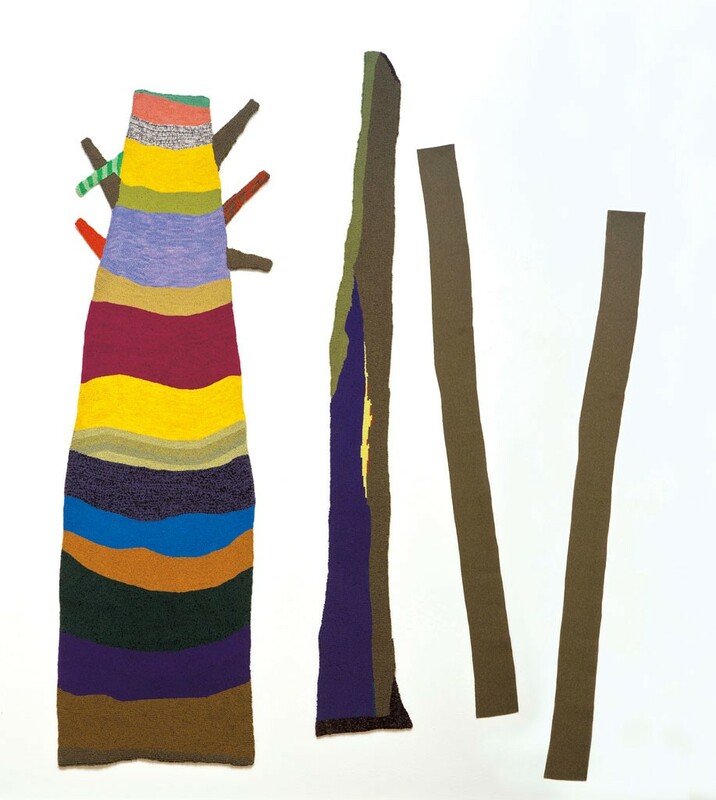 "Tall Trees" (109 by 89.5 inches; recycled, hand-dyed wool hand-hooked on linen) by Liz Alpert Fay of Sandy Hook, Conn., consists of four flat, abstract verticals. Despite bearing only a fleeting resemblance to trees, Fay's constructions leave no doubt about what they represent. Her artist statement says, "Just like people, some trees stand out in a crowd more than others." She's got that right. Her exacting work undulates in rich colors on the wall. Nearby, as if it were a woodsy companion, stands Susan Perrine's "Contrapposto III." She wove fresh-cut ash, maple and birch saplings together to create a 5-by-5-by-8-foot twig structure. "Circular huts, large enough for two, provide a quiet spot for a tête-à-tête or become lively play spaces," the Maine artist writes in her statement. 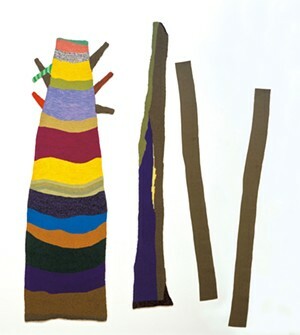 Perrine's inventiveness with materials emanates from "Book Jacket" (14 by 60 by 3 inches; recycled, cut books). The piece is hung high enough to look like a giant Mothra clinging to the wall, but viewers can see that children's boardbooks were cut and stitched together to create this uniquely wearable work. On an adjacent wall, quilter Susan Damone Balch of Reading beautifully deploys modern techniques to interpret a traditional design from an antique Navajo rug. 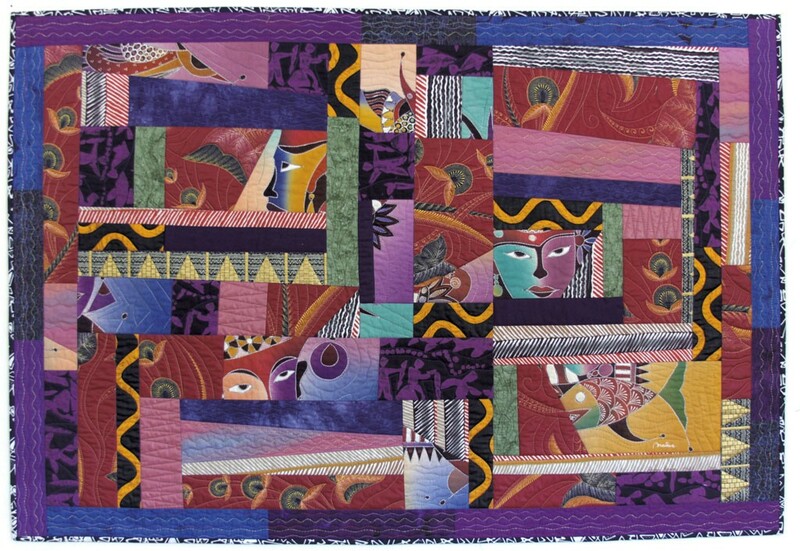 Her aptly named "Eye Dazzler" is a 112-by-84-inch wall hanging, machine pieced and quilted with variegated cotton thread. This, along with Balch's two other wall hangings, is mesmerizing. Some works here tell stories or otherwise express the human condition, such as Christine Fries' 66-by-80-inch wall hanging "Miranda: The Tempest." A scene from Shakespeare is the subject of her adaptation of J.W. Waterhouse's painting "Miranda — The Tempest." Fries used machine and hand appliqué, machine embroidery, layered tulle, and fabric paint to achieve her stunning effects. In her statement, Fries says she admires the English pre-Raphaelite painters. She evidences that devotion by investing her work with nuances, making numerous fabric folds in Miranda's dress and stitching each strand of hair to emphasize the direction of strong winds. Waterhouse and the Bard himself would surely have been impressed. Using photo transfers, New Hampshire artist Tafi Brown created "Alstead Flood: Mashed, Gnashed, Rolled and Rumbled," a 53.5-by-52-inch hanging quilt. Her powerful, photographic images report the story of the catastrophic 2005 flooding that took lives and devastated her town. Repeating images of a corrugated culvert create a design that also shows how raging floodwaters destroyed it. Wen Redmond, also from New Hampshire, evokes personal narrative by merging photography, collage and surface design to create digital fiber collage. 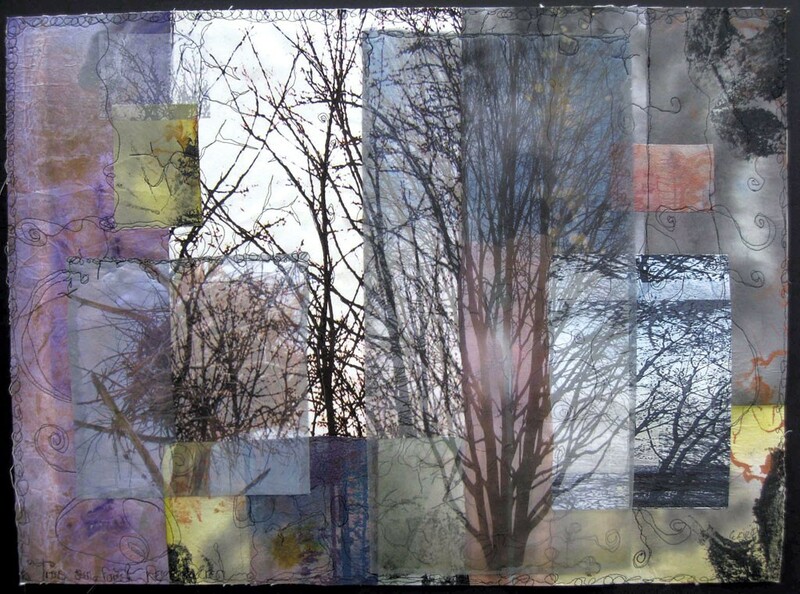 "Trees Seen, Forest Remembered" (24 by 33 inches) and "Coming Back" (28 by 24 inches) incorporate images of her favorite trees and fleeting bits of text. The blended techniques and layers of fabric create a muted reminiscence. Burlington artist Marilyn Gillis says she makes art as a visual record of her life. Using hand dyeing, painting, drawing and quilted fabric and paper, she takes us along on her journey. An abstraction of birch trees guides us to fleeting images of summer cabins on quilted cotton fabric in "Adirondack Cabins" (42 by 27 inches). More powerfully, the repeating images and variations of "25 Sunsets" (51 inches square; quilted synthetic fabric and paper) stand like a testament to favorite and bittersweet memories, enumerated in sunsets. Like Fries, Kate Themel of Connecticut adapts a famous painting into a wall hanging; Gustav Klimt's "The Kiss" is the subject of her 63-by-43-inch "Ode to a Kiss." With batik cotton, metallic fabrics and glass beads, it conveys a rich, lustrous portrayal of two people in a deep embrace. Themel's painterly "Blood Iris" (46 by 33 inches) is cut and layered using raw-edge appliqué and quilted using hand-guided machine stitching. Themel's creativity is stunning. With the pull of a thread, a hook snagging wool or a needle puncturing fabric, these highly accomplished fiber artists transform their soft medium into artful abstractions and deep narratives. The original print version of this article was headlined "Hooked on Fiber"